We have been the recipients of some wonderful and extraordinary acts of kindness of late, some that I won't discuss right now. Thank you! 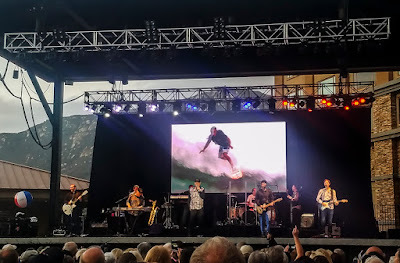 Last night Don and Diana took us out for a nice dinner and then to a Beach Boys concert at Pala. I had seen the Beach Boys in the seventies, with a Wilson or two and Jardine. This was a different band, Mike Love, Bruce Johnston, Mike's son and a bunch of other guys. John Cowsill on drums. That Cowsill. I am a critical sob but I have to say, the band was tighter than the original and the harmonies were perfect. And it doesn't get any better than a Beach Boys harmony unless you somehow find yourself in a Gregorian chant. Some of the song selection was a bit iffy (ballad of ole betsy? ), at times it was like a greatest hits package of the fifties but they still managed to hit all the right spots. Audience looked older than my father and he is dead. Mike Love is still a funny guy. Liz and her amiga were there... they thought it was great! I saw them in 1961 or 62 at Surf-O-Rama at the Santa Monica Civic Auditorium. They were just starting out and playing in the lobby... outside where the surf movies were shown!! We've heard this tune before. Who shall we ban tomorrow? Frankly I don't give a damn.